The training venue was the EBC Church at Kompri, EHP. How do you manage 70 plus participants with 2 facilitators? The answer is you cannot properly facilitate a good story telling workshop with such a number and expect that everyone will understand it. Johnson and I decided to do the first things first; read the Bible and state the reason for the oral story telling workshop. We used Ephesians 4:11 – 12 to share what we wanted to do in a very short time. The original time was four days and then reduced to 2 days! Our first point was that the gifts given to the Church for ministry were given by the Lord Jesus Christ himself (verse 11) In other words those who are involved in full time ministry are not strangers to Jesus. He exactly knows each person involved in ministry by name and the kind of need each person has in terms of ministry. Our second point was the purpose of each ministry; to equip the saints for ministry in order to build up the body of Christ. In conclusion Jesus himself is involved in calling and equipping his workers who will be effective in building up his body. So that all involved will be instrumental in helping others attain to the unity of the faith, have knowledge of Jesus as the son of God (13). We were humbled to realise that most of the 70 were not empty vessels for us to fill, that what we were about to teach was not a brand new knowledge that we were masters of; but just another tool to assist them in ministry. Now with this knowledge we started the training. The traditional way to monitor small group is to allocate a mentor to each group so that the instructions from the main facilitator can be carried out. We were outnumbered by a large margin so Johnson and I divided the group in half so that at any one time we were each mentoring four groups of six people. By the end of the first hectic day we discovered a couple of people who got the feel of things and they assisted us to be in charge of their small groups; we concentrated on the groups that need more time from us. We discovered that the important features of an Oral Strategy Workshop (OSW) that can make or block the teaching is the following; the biblical method using Nathan’s story in 2 Samuel 12:1-7, demonstrating the technique of telling a story and finally the 5 steps of telling a story and the 5 steps of asking questions related to the story. As we do more OSW’s we are discovering more and more that the importance of orality and the statistics of reading verses listening is not so crucial for our kind of participants. They prefer to go right into the steps and do it right. As a result we spent more time to drill the steps and have them translate the steps into their language. The feedback showed that they all understood the steps and they really want to have another course to perfect their knowledge of the steps. 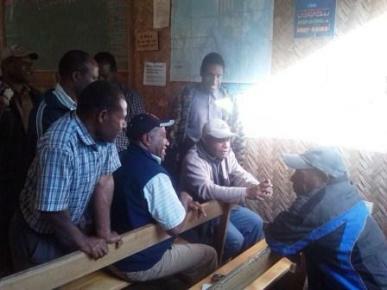 Deacon Tom Nakambi did a family Bible study after the first day and his small group was amazed at how he could clearly explain the Scriptures for them to understand; for them it was a new approach and they loved it. He later shared that he was tempted not to tell them that he picked up the method from the OSW training. A Sunday School teacher stated that this method was a perfect one for them and he thanked the Lord that he was able to participate and learn the steps; he wished all the other teachers could come to learn this new and exciting way of sharing Bible stories. Francisca Ainu with her certificate at graduation. She is one of those who wants to become an OSW trainer. Fifty people requested for the training to be done again because the approach of storytelling is what they needed in their ministry and they want to make sure that they remember it well by participating again. Eleven participants gave in their names as volunteers to be trained as OSW trainers. 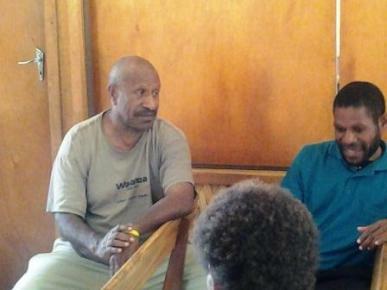 They all indicated that they love the way it is being done and want to train others to use it for their Church. The plan then is to bring in the eleven two days before the actual workshop to prepare them for the next batch of participants. The overseer of the EBC Kompri Circuit Pastor Tukana said this time we had 70 participants but we expect over 100 for the next training. 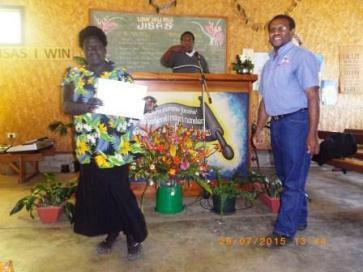 Ps Tukana, overseer of EBC Kompri Circuit receiving his certificate from Bryan. Pray that the LT team will have enough personnel to help mentor the small groups and spend enough time make sure that all know how to use the steps. We praise God for the record number of 70 who attended the OSW and we look forward to many more that the Lord will bring for this exciting training. The next group of Kamano speakers will use the steps which were translated by the 55 Kamano speakers that attended the first OSW. I used my mobile phone to share the reason for the workshop from Ephesus 4:11-13 at the start of the workshop. 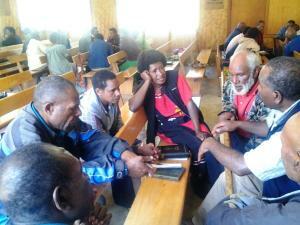 By the end of the day we had participants requesting for bibles on their mobile phones. Another opportunity for participants to download free bibles from the CRMF WIFIBible Box. 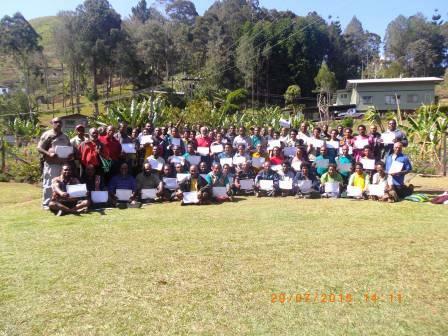 The 70 Participants with their certificates.